Thomas, not sure if this is something relevant but airlines now state it is OK to use an am/fm radio on board aircraft. Not much possibilities for AM unfortunately but on a recent flight from Ft Lauderdale to Dallas and Albuquerque I hooked up an SDRPlay receiver to a 3 inch stick antenna and recorded a few stations I was able to pick up along the way. I did take a few more videos flying between JFK and MIA as well. If needed, the size of the setup above can shrink further if a smaller laptop/tablet is used and an RTL dongle instead of SDRPlay. You will also need to equip yourself with a window seat. Otherwise, signals are significantly weaker. I did not place the antenna in a special position, just next to me on the seat where it could not be noticed by other passengers. I uploaded a few more videos from my weekly shuttle flights between MIA an JFK. Wow! Thanks so much, for sharing this, Ivan. I’ve always packed a simple FM-capable radio in my one, compact carry on bag and typically try a little FM DX travel while in flight. I was never aware there was a restriction on using an FM receiver in flight, but I’ve always kept my radio listening very discrete so it’s never been a problem. I love the idea of doing in-flight FM spectrum captures! It would be fun to watch signals on the spectrum shift and change as the flight progresses. Very cool, Ivan! Post readers: Have you ever made in-flight FM spectrum captures like Ivan? Please comment! This entry was posted in FM, News, Software Defined Radio and tagged Aeronautical, FM, FM DX, Ivan Cholakov (NO2CW), SDRplay, SDRplay RSP on October 28, 2016 by Thomas. We’re getting ready for the B16. Here is our new schedule. Changes include WRMI reductions and Ch292 commencement. We air for the first time on Channel 292 6070 Nov 5th. 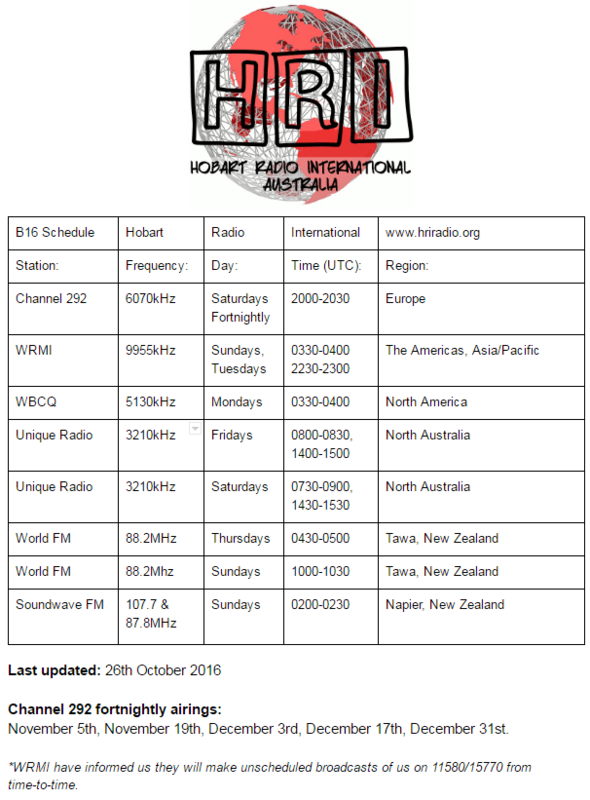 This entry was posted in News, Schedules and Frequencies, Shortwave Radio, What's On Shortwave and tagged Hobart Radio International on October 26, 2016 by Thomas. JoJazz is the most important competition for young Jazz musicians in Cuba. This week and next, we will dedicate our entire program to it. 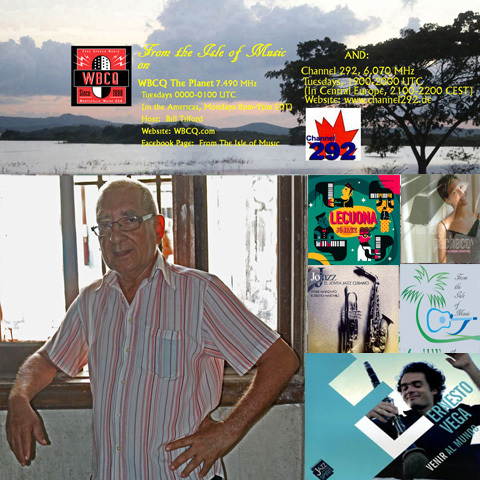 Our November 1 (October 31 in the Americas on WBCQ) program offers music from past JoJazz winners and an interview with the competition’s founder, Alexis Vázquez. This entry was posted in Uncategorized on October 26, 2016 by Bill Tilford. [DRMNA] Can you tell us a little about the process taken to develop the new receiver? Click here to read the full interview on DRMNA.info. 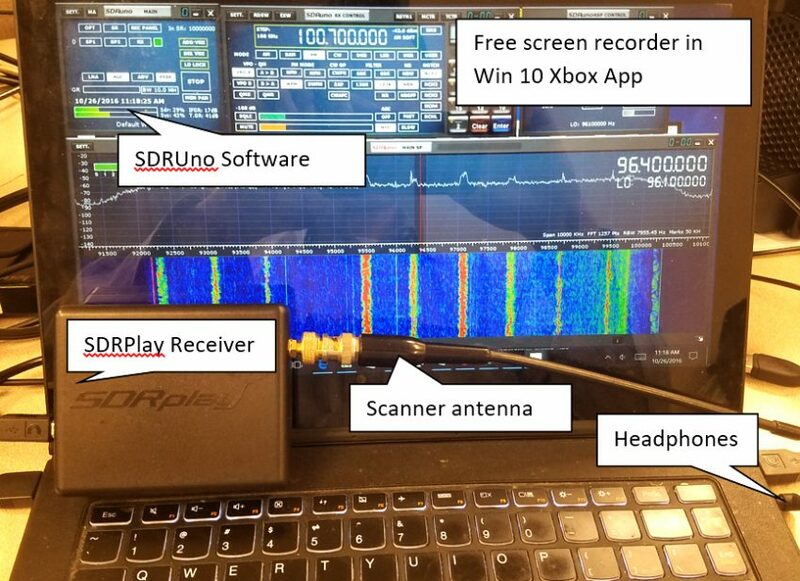 This entry was posted in DRM, New Products, News, Shortwave Radio, Software Defined Radio and tagged DRMNA, DRMNA.info, Interviews, PantronX Titus II, SDR, shortwave, Shortwave Radio, Software Defined Radio on October 26, 2016 by Thomas.